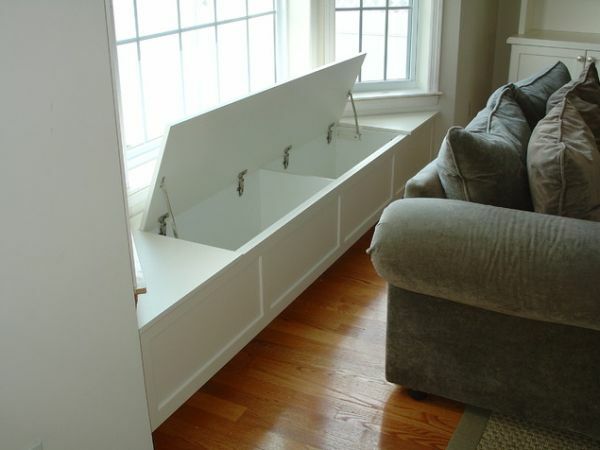 In small rooms furniture arms should be sleek and slim, or even removed altogether. Slipper-style sofas and chairs are upholstered pieces that don’t have arms, and they are great for small rooms because they can save several inches (or even feet) on each side. Visually they also look significantly slimmer, sleeker and smaller. Just be sure that you know how you want to use your furniture (particularly the sofa) before you buy slipper-style pieces. If you’re the type of person who likes to lay your head down on the sofa arm this style may not be for you. Overly decorated and fanciful furniture can make small rooms look even smaller. If you want to make your room look bigger it’s far preferable to use streamlined pieces with sleek and simple silhouettes. Furniture pieces with straight lines look cleaner, but they also fit into small spaces more easily than those with curves. So if you’re struggling with space, square and rectangular furniture is best. However, if your style leans more towards curved, decorative furniture you don’t have to give up on it completely. Try using one piece as an accent, or create a focal point using something decorative. For instance, a large mirror with an ornate frame can look great when paired with streamlined furniture. Just resist the temptation to overdo it. If you don’t want a room to look smaller than it really is it’s imperative to get the right size rug. Getting a rug that’s too small for the room is one of the most common decorating mistakes people make, and the reason it’s bad is because it makes a room look choppy and disjointed. In every room, but small rooms in particular, you need to make sure the rug is big enough. That means that for most rooms there should be about 10″ – 20″ of bare floor between the edges of the area rug and the walls. If that’s not possible without purchasing a custom rug just remember that you should always try to have all the legs of major upholstered pieces sitting on the rug. Or at the very least the front legs. The rug should never stop short of the furniture legs. If it does it’s too small. If your room is larger than average you may want to consider two area rugs, with furniture arranged into separate conversation areas on each. While a little unconventional, it’s preferable to trying to get one massive rug. Standard rugs stop at about 12′ x 15′ so if you’re room is much larger than that you might have to go custom in order to avoid the rug being too small. Two rugs is a nice alternative. Nothing makes a room shrink like clutter. As soon as “stuff” starts to accumulate, your room will feel smaller and smaller. And if you’re starting with an already small room then you don’t have a lot of leeway! The best way to stop this from happening is to make sure you’ve got enough storage. Since adding storage units isn’t always feasible, look for items that have hidden storage. 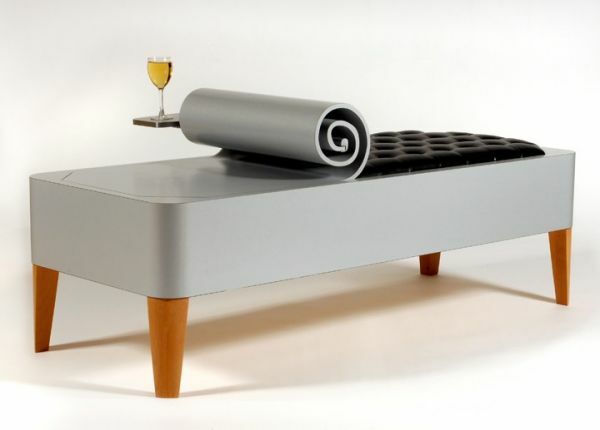 Coffee tables with shelves, side tables with drawers, and hollow benches with removable tops are all ideal. Storage baskets can also be great for corralling all the things that tend to accumulate and make your space feel cluttered and small. Want to make your room look almost twice as big as it really is? Get a huge mirror. Mirrors are great for making spaces look bigger, and their power should never be underestimated. 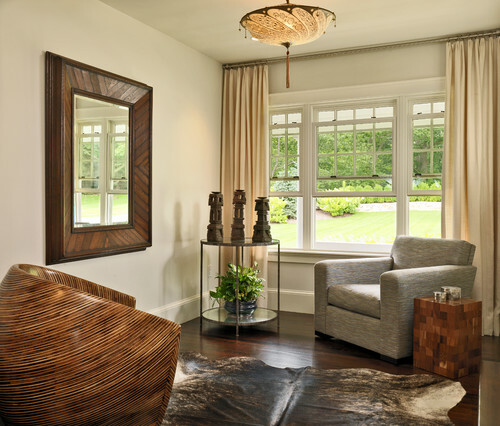 Ideally a large mirror is best, but even small-to-average size mirrors can have an impact on the perceived size of a room. Where you hang it (or lean it) will depend on your room, but it’s always a good idea to have it sit across from a window if possible. The natural light will be reflected and make your room look huge. And never be afraid to use a large mirror in a small space. Mirrors create the illusion of depth and space so they can really help make a small room feel bigger, and if you get one with a unique frame it can offer a great decorative punch. 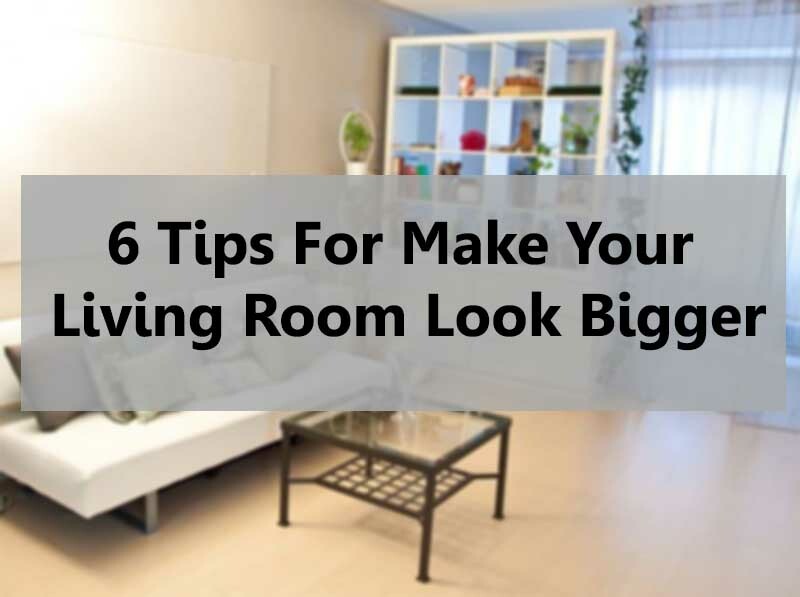 You can’t change your ceiling height, but there is something you can do to make it look taller, and thus make your room look bigger. First of all, make sure to paint the ceiling white (or a very, very pale color) – but don’t stop there. Paint the top quarter, fifth, or sixth (depending on the height of your ceilings – trust your eye here) of the wall the same color. It will trick the eye into thinking the ceiling is higher than it really is. And if you don’t like the look of the two paint colors butting up against each other near the top of the wall consider placing a chair rail or other piece of molding around the room where they meet. You can do any style you like, just make sure it isn’t too thick or bulky. If it is it will negate the paint treatment by cutting the wall off and making it look choppy. Now you no need to worry about tiny living room, it can fix anyway. Well, thank you internet!